Имате въпрос към Sok San Beach Bungalows? 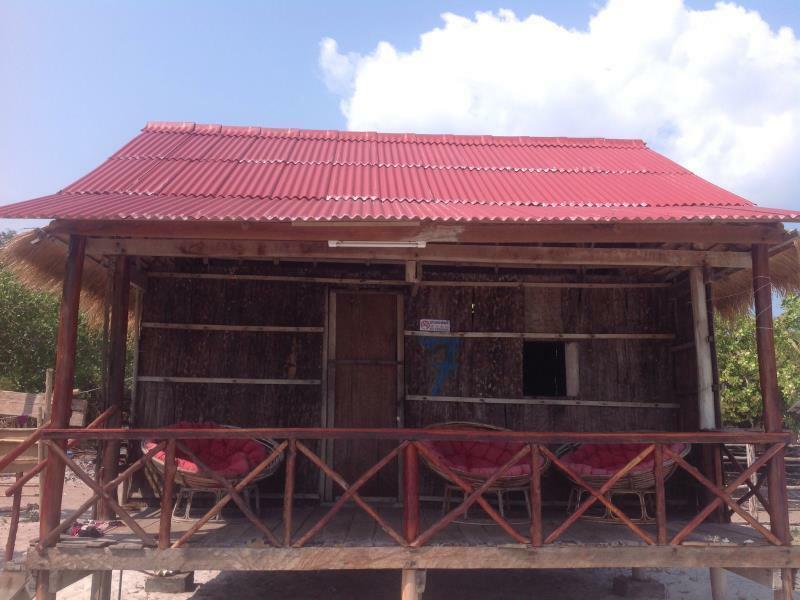 Сгушен в сърцето на Sok San Beach, Sok San Beach Bungalows е идеалното място, от което можете да започнете Вашето приключение в Koh Rong. Разположен само на 35 km от центъра на града и на 55 km от летището, този 2-звезден хотел привлича всяка година множество посетители . С удобното си местоположение хотелът предлага лесен достъп до всички градски забележителности, които задължително трябва да се видят. Предлагайки висококачествени услуги и широка гама от удобства, Sok San Beach Bungalows Ви осигурява възможно най-комфортния престой. Wi-Fi връзка в общите части, семейна стая, барбекю съоръжения, ресторант, екскурзии са само част от нещата, които отличават Sok San Beach Bungalows от останалите хотели в града. Всички стаи се отличават с грижливо замислени удобства, което гарантира неповторимо усещане за комфорт. През деня можете да се насладите на отпускащата атмосфера благодарение на частен плаж, риболов. 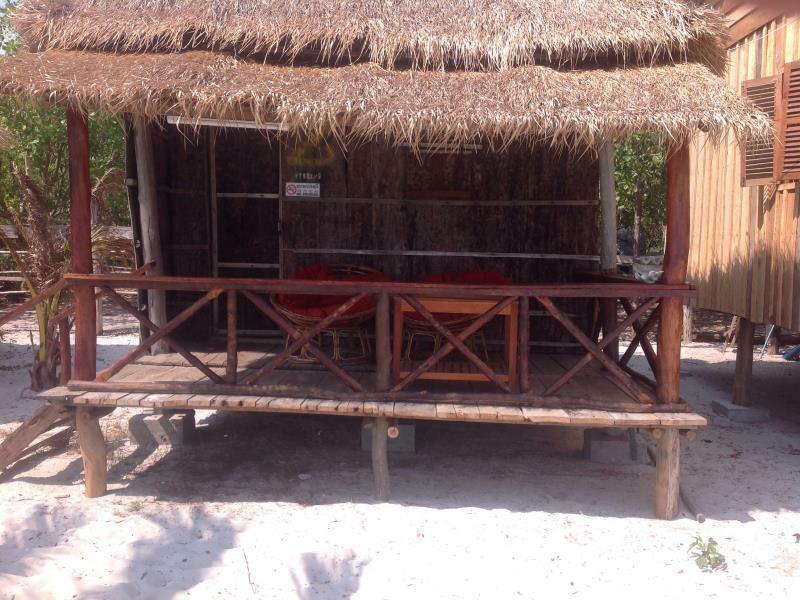 Sok San Beach Bungalows е най-подходящото място за Вас, ако търсите качествен хотел в Koh Rong. There is only one fast boat available to get to Sok San Beach Bungalows. The fast boat leaves from Sihanoukville at 1:30 PM every day and leaves from Sok San Beach Bungalows at 12:30 PM every day. The trip takes 40 minutes. Please contact the hotel for more details. fantastic view, good staff, all good! A great set up with bungalows right on the beachfront. Great location on a stunning beach so good to get away from the crowds and relax. Julian and the team are very helpful and serve up some great good. Couldn't ask for more and I'll be making a return visit when I get the chance. I had the best stay in Sok San Beach Bungalows( not to be mistaken with Sok San NEW beach bungalows- way worse) so far on my month and a half SEAsia trip. Julian and his lovely partner where so accommodating and helpful, and the location simply could not be better. If you are an air conditioner, all inclusive customer this might not be the spot for you( there are couple of 200$ night hotels in comparative proximity), but if you like to stay in authentic bungalow with the comfort of a big clean bed and your own bathroom - this is the spot. I really hope I can spend another week or two there. Rooms are very basic, you are paying for the beach not the room but pleasant enough. People not accustomed to basic old school bungalows might not be able to stay. We are 3 friends traveling together and booked a bungalow on Sok San Beach Bungalows for two nights. It was a great choice ! The bungalow is simple but you have everything that you need and to be honest we loved the style. You are directly on the beach with an amazing view. The food is one of the best here on Sok San beach. I absolutely recommend it and would stay again ! Friendly staff, clean. Bungalows right on the beach, simple but that's what I wanted. Julian who runs the place is just fantastic. He told me where to go snorkelling and how to get to the waterfall. The food was excellent. I had booked 4 nights but stayed another 3 nights, because I really enjoyed the place and the surrounding. 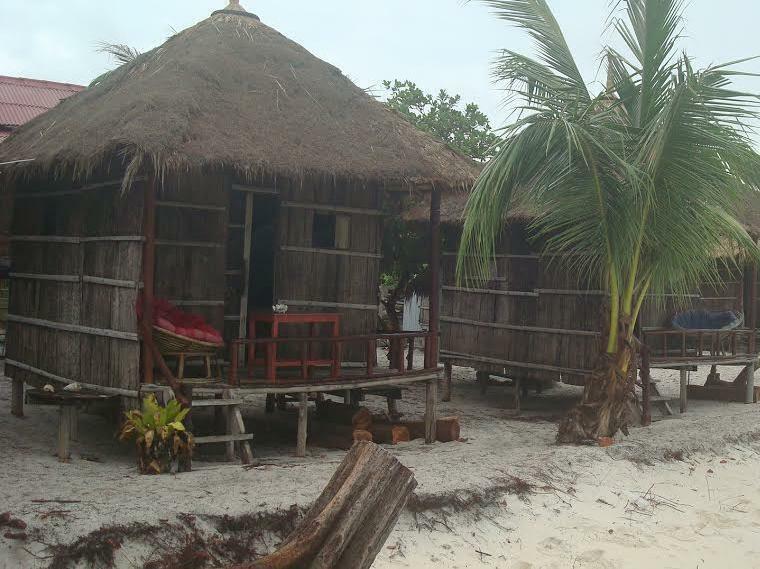 My beach bungalow was just a couple of meters from the sea, and I've almost never slept so good ever, every night as I did now. Sok San Beach Bungalows is in the north part of the 7 km long beach, and there are some more bungalow resorts and even a small local fishing village. South of Sok San it's still totally empty, you can walk and be totally alone on an endless paradise beach with crystal clear water. As a guest of Sok San Beach Bungalows you can borrow snorkelling equipment for free. Just ask Julian, the owner, and he will tell you the best places to go. I also went on a boat day trip further north where we first stayed snorkelling outside a coral reef and then went fishing. After that we had a beach BBQ and watched the sunset on the same beach the TV show "Survivor" has been produced. Visiting the nearby waterfall and be able to stand in it and take a shower was also great. But the best of all was my staying at Sok San Beach Bungalows and getting to know Julian, the always happy and helpful owner. In Cambodia they like to copy things. So remember that this is the original Sok San Beach Bungalows. Because there are also other places with similar names, like "Sok San new beach bungalows" "Sok San Beach resort" and "Sok San long beach bungalows". If you want to experience simple beach life, like Thailand 25 years ago, I really recommend you to visit these paradise Cambodian islands. But don't wait too long, development is coming quickly. Truly amazing! I never wanted to leave. Make sure you understand the main area the speed ferries take you to is koh touch beach. Sok San beach this is the other more remote side of koh rong and the only way to get to this beach is by another boat. There is a boat that leaves koh touch for $5 at 1pm daily or you can take a direct boat for $20 from Sihanoukville. Contact the owner or go to website for details- we had to push our reservation back because we couldn't get there! Once you're there it's absolute paradise though. I highly recommend staying here. Julian, the owner, was helpful, entertaining and went above and beyond to make our stay enjoyable. The beach was amazing. Perfect even. 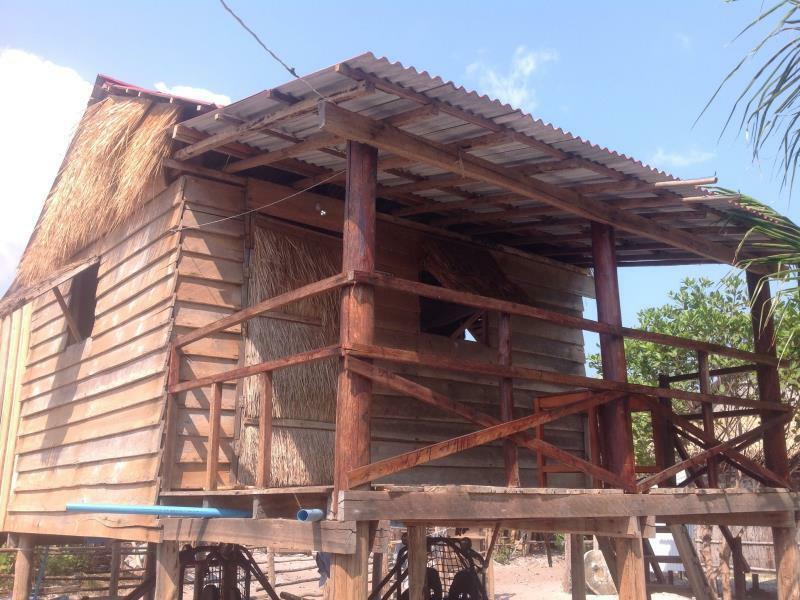 Lovely rustic beach bungalow situated in a local fishing village. Facilities are limited but that's part of the experience. The power goes out when the solar batteries are drained in the evening, but you're on an island, embrace it :) Getting off the boat to the pier in rough waves isn't easy, so be prepared to take a leap if the sea isn't on your side. The view from the room is great! The Bungalows are located on Sok San Beach, which is a long beatiful beach with white sand, turquoise water and a couple of places to stay on one side of the beach. 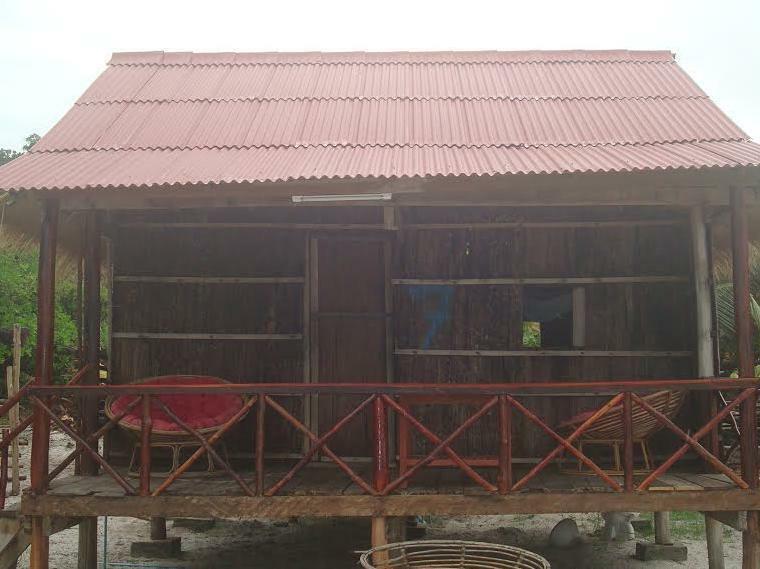 the bungalow was a clean basic wooden bungalow right on the beach with a great porch overlooking the ocean. There are a couple restaurants araound which offer good value for about 3-5 dollars a meal, but dont expect any sort of nightlife on this side of the island. definitely recommend this place for 2 nights if youre headed to koh rong and are looking for some beautiful quiet place to chill out! The bungalow we got was right in front of a very noisy bar. Impossible to sleep, even with ear plugs. Holes in the mosquito nets. Barrel bolt was broken, so we had to sleep in an unlocked bungalow. No sockets to recharge camera/ phones. Too expensive for what we got. Avoid bungalows 1-4, as they are in front of the bar. Friendly Western owner but totally unsympathetic when we asked to be moved. 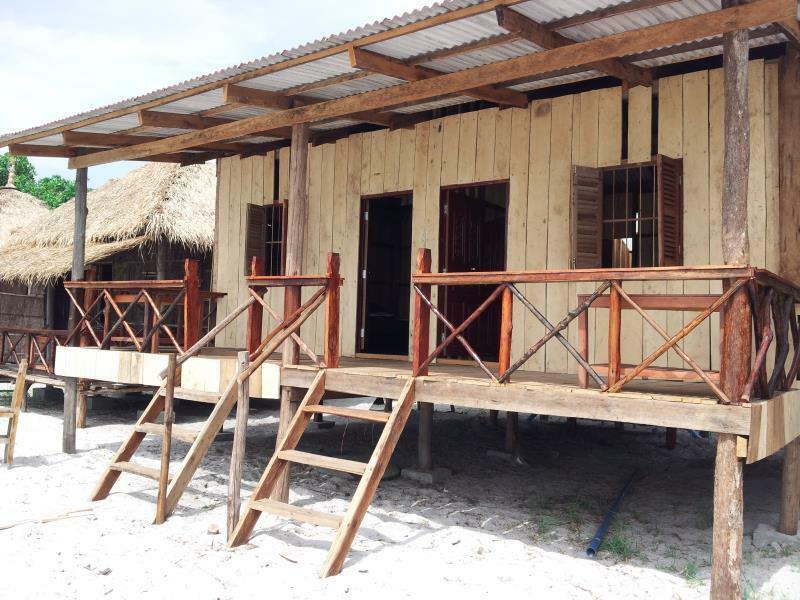 Next door is the new Sok San beach bungalow, cheaper and better! My stay wa sperfect such an incredible location. It's quiet and serene. You can have the entire beach to yourself. It's perfect. The restaurant was also amazing!! Julian the owner, the beach, the simplicity. Not what is advertised and not what was expected Having travelled extensively, this is the first time that we have arrived at booked accommodation, which was totally different to what was expected and of a totally unacceptable level. The description on agoda.com is incorrect and misleading. We expected a basic bungalow on a secluded beach in a quiet environment. What we found was a rudimentary bungalow at best ( bark walls with big gaps, palm leaf roof in need of replacement, very basic bathroom without basin and with a permanent puddle in the middle, floors of bungalow and bathroom so dirty that feet are black permanently, no hooks anywhere to hang towels, table and toilet covered in black grime, no windows, no cover sheet and pillows urgently need replacing ), location is not secluded, but set in the village between 2 other bungalow resorts. 1m behind our unit is a Karaoke Bar, which plays extremely loudly until at least 24h00 - starting at 12h00 or 18h00. The restaurant serves very tasty food at reasonable prices, the staff is friendly, but the furniture needs cleaning and upgrading. The location on the beach is great, but due to the village and the other bungalow resorts the cleanliness of the water and beach is being compromised. A 20 minute walk towards Longbeach lets one enjoy the pristine beautiful white beach and turquoise water. The plankton at night is great in the water outside the bungalows. The new owner, Julian, was very friendly and helpful and has plans to upgrade the bungalows. We found new accommodation after 1 night. In its present state I cannot recommend it.